During our series on Pop Culture issues, we had thought the music week would bring some negative comments, but there weren’t any. Most people enjoyed it and related to what we were saying. Yesterday we brought up the subject of the environment. We challenged people about consumption and waste. Although we did receive some comments, by far the attitude has been positive. 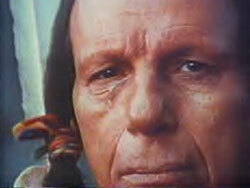 We used the Iron Eyes Cody commercial from the 70’s about polution to introduce the concept. We ended with a challenge to at least change a light bulb. I don’t know how many bought energy efficient light bulbs, but I do know that we haven’t scooted from the issues that our people deal with each day. Our philosophy is simple. If you are asking questions about something in your home or in your own mind, we should be asking them at church. We don’t have all of the answers, but at least we can begin the conversation. This entry was posted on November 26, 2007 at 9:32 pm and is filed under Creativity, Cultural Ideas, Influence, Lifepoint, Message Series. You can subscribe via RSS 2.0 feed to this post's comments. You can comment below, or link to this permanent URL from your own site.